If you’re looking for a way to get started with securing access to your trees via Single Sign-on, you’ll first need to have an Identity Provider to manage your logins. Okta is a great service – it’s easy to set up, and very popular. 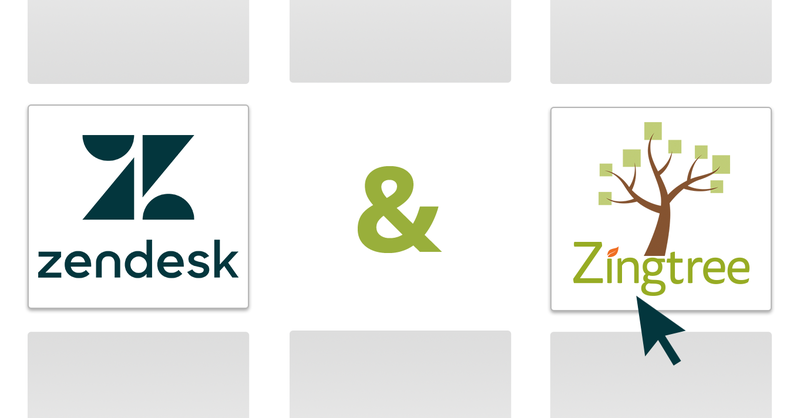 This article will show you how to get Okta and Zingtree working together. Okta needs information about Zingtree. Zingtree needs information about Okta. Once you have Zingtree and Okta successfully working together, you can limit access for authors and/or employees or agents. For the setup, we recommend keeping two browser tabs open – one in Okta, and one in Zingtree. If you haven’t already created a free Okta account, do it now. Go to the Okta Dashboard. Click Add Applications under Shortcuts. Choose SAML 2.0 as the sign-on method, and click Create. In the General Settings, give your application a name (like “Zingtree”), and click Next. Under SAML Settings, configure it as shown below. For the Single Sign-on URL, use Zingtree’s Login URL. For the Audience URI, use Zingtree’s Entity ID. Click Next to finish the SAML setup. In Okta, click Applications from the top menu, and go to Applications. 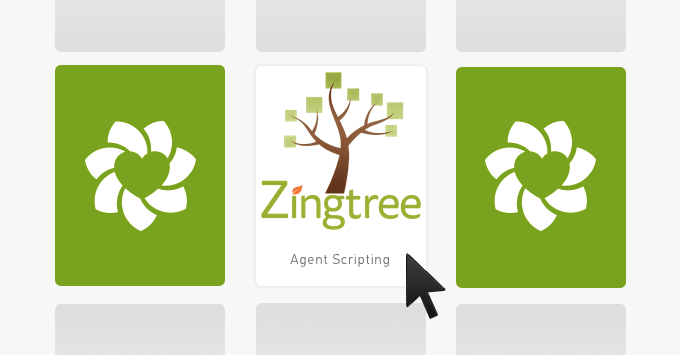 Click the new Zingtree application we created. Click Sign on, then View Setup Instructions. Keep this page open in a browser tab. Now go back to the Zingtree tab, and click Edit Identity Provider Data. For the Zingtree Entity ID, use the Okta Identity Provider Issuer. 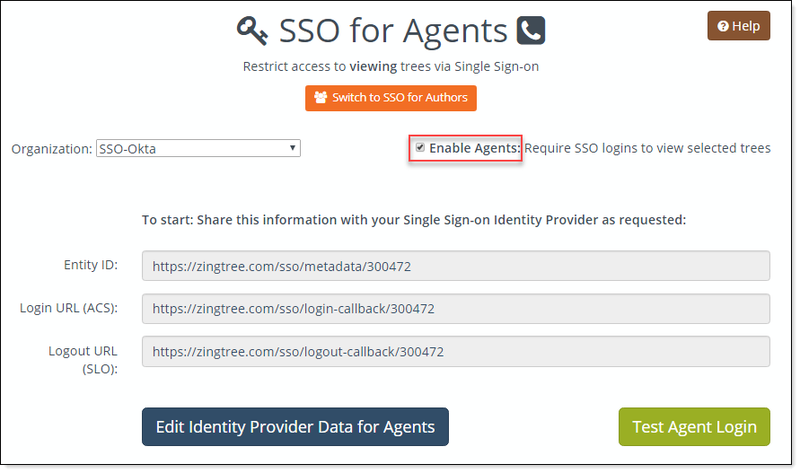 For the Zingtree Login URL, use the Okta Identity Provider Single Sign-On URL. Copy the Okta certificate into the Zingtree certificate field. Click Save Identity Provider Settings. If you’re embedding trees in another page, or using an integration via Zendesk, Salesforce, Freshdesk or other apps, you may also need to tell OKTA allow for CORS requests. OKTA describes this here. Set the origin URL to https://zingtree.com, and tick both Type options. In Zingtree, go to Account, Single Sign-on. Click the orange Test Agent Login or Test Author Login button at the lower right of the page. From here. you can test logging into Okta from Zingtree. If you’re already logged in, the test will just return your email or another identifier from Okta. If you’re not yet logged in, the Okta’s login screen will appear, and then you will be returned to the Zingtree SSO test page after logging in. Go to My Trees, and select the tree that you want to require SSO login. Check Require Single Sign-on (SSO) Login to Access. Note: Once SSO is set up, any new trees created will have SSO required by default. Go to Account, Single Sign-on. Click Switch to SSO for Authors. Make sure Enable Authors is checked. One More Step: You also need to add authors to your organization via Account, My Authors. They will not be required to use a Zingtree login to gain access, but this also validates them as a person who has access to your organization’s trees. In Okta, select Settings, Customization. Make sure Allow iFrame Embedding is selected. Any questions? Don’t hesitate to reach out. This article was originally published in 2017 and has been updated for accuracy.